Although testing is used to help developers build a stable software but mainly it is aimed to find defects in any application. Earliest testing techniques consisted of Manual testing only but as more cost, time and labor was required for testers; use of Automation tool was preferred known as Automation Testing. The decision about selecting one of the two approaches depend on the scope of the application to be tested, the feasibility of the software and its scalability. Before understanding that which one is better, let’s take a look at what these techniques actually are. Automated testing process is the one in which the tester takes the help of a software to control the tests in order to test an application. 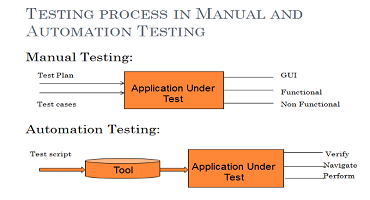 While, Manual testing is the method of testing a software where each and every step required to test the software is performed by the tester as an end user. 1. Write a script in a source code which can be used to test the application. 2. Run the script to execute the steps required to test the application. Automation can be used to execute low level interface regression test which require same operation to be performed again and again which can be laborious over time. This proves Automation technique to be more cost effective and time saving which can accommodate minor changes which doesn’t break the application. Moreover, the scalability of scripts helps us to run the same scripts across multiple environments (for example-cross browser tests). 2. Reducing human efforts by saving time. 3. Platform and OS independent. GUI testing, API driven testing are performed by using Automation techniques using tools like Selenium Webdriver, QTP, etc. Selenium’s cross browser compatibility and OS independence make it an ideal tool for Automation test scripts. Moreover, low maintenance cost makes this technique more usable. Even if there are some minor change in GUI, there is no need to re-write the entire test script again. You can only change the start-up libraries and data and new script is ready. This certainly makes Automation test more preferable in the industry. 1. Find the requirements and create a test plan accordingly. 2. Create a test suite and write a test case step by step. 3. Execute each and every test case step by step. 4. Report the bug with all the details. Manual testing in its way is beneficial in testing a high-level regression suite in which the application is constantly undergoing changes. For example – Testing a website which is daily undergoing major changes can contain some defects which could break the application in a major way. Applications which require to improve customer experiences are always preferred to be tested manually. Now the question arises that which one is better? Manual or Automation? Both the techniques are important and beneficial in their own aspects. But there are always some disadvantages for every technique while testing a software. Below are the some points for comparison of both methods. Moreover, Manual testing can be best used while Exploratory testing, Adhoc testing or Usability testing. While, Automation testing is best suitable for Load and Performance testing where thousands of users are to be emulated at the same time which saves a lot of time as well as efforts. But using an automation tool may consume more time when there is a huge amount of test data required because collecting this data can take a long time which can be overcome in Manual test techniques. 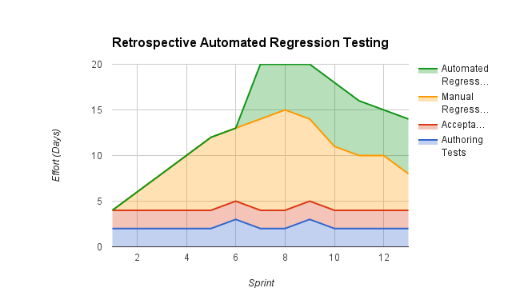 The graph above tells us the case that how many days are required in the context of Retrospective tests which means tests executed in pasts which needs to be run again. GUI testing is preferable using test scripts but what happens when there are major changes in a website which may break the whole application. This indeed requires a Manual tester which performs each mouse gesture or keystroke ensuring that application won’t break. Even an automated regression suite can be tricked if the output varies significantly. So, the question still remains that Which one is better? Automation or Manual? Indeed Automation testing can be used to run tests over night which definitely reduces next day’s work but the scripts were still created by a tester manually and what if the test suite is stopped due to a system error or was passed due to output variation or due to major changes done prior to the test script being written. There will always be some applications which will require a human eye and mind which is able to find workarounds which a test script cannot find. Hope this article helps you to decide which technique to be used! If not then you can always contact us at ProtoTech Solutions to decide which technique is be best for your application.